Only last Sunday, on th15th of January 2012 I received a message from my friend, who’s working and living in the world renowned Kruger National Park. She wrote to me that the summer rains were very late, and she hoped rain would fall soon. 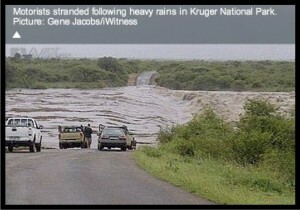 This morning, on the 18th of January 2012, I got the word that a large part of Kruger National Park was flooding. Like the terrible floods of 2000, this floods are caused by a cyclone heading for Mozambique. During the day we received messages and photographs of the situation, and we can’t believe what we are seeing and hearing. The small town of Hoedspruit is closed down and people are evacuated by helicopter. Most of Kruger Park (which is about half the size of the Netherlands) is not accessible anymore, de Blydepoortdam is on the way of breaking. The amount of rain that has fallen goes beyond your imagination: some places got almost 300 mm in 24 hours. Bridges and roads are washed away, a number of camps in Kruger are being evacuated during the day, people are taken out by helicopters. Other camps, like Skukuza and Lower Sabie are cut off. In Skukuza, the main camp in Kruger National Park is off electricity around 18.00 hour, so people who got stuck there has to face this ordeal in pitch-dark. Weather forecast keep saying that the worst is still to come on Thursday and Friday. The heavy floods of 2000 made so many victims among the animals and caused so much damage, you can’t image the ordeal that both humans and animals are going through right now. I’ll keep my fingers crossed and hope and pray that “Gaia” calms down soon.